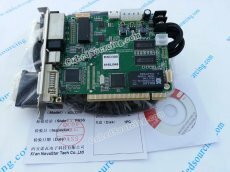 Novastar MSD300 is also called NOVA MSD300 that has been Novatar company's proud sending card. Currently, along with LINSN TS802, most of the LED display manufacturers in China have chosen this MSD300 sender card as the number one control system for their products. With the reputation of outstanding performance, products of NovaStar are used widely in LED displays all around the world. Now, after the 2nd generation led control card, NovaStar has successfully developed the 3rd generation control system. The control system (3rd Generation) is specially designed for mid/high end led display screen. Besides all the functionalities in the 2nd Generation led control system, the 3rd Gen control system also features in the following. 5.Supporting almost all conventional resolutions and LED light driver chips. The items arrived so fast! Thanks so much.